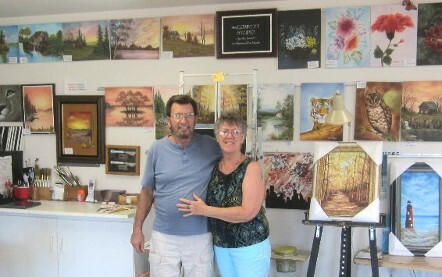 We're Jim & Yvonne Corbett and we've lived and worked in Arizona for over 25 years. A number of years ago Jim gave me a Bob Ross Master Painting Kit for Christmas. I persuaded him to sign up with me for a painting class - knowing he wouldn't follow through with it. But he did! - he loved it! - and after experiencing our first painting class as students we were hooked on the wet-on-wet technique. Three classes later, we decided to enroll in the Bob Ross Certified Instructor's course ourselves . . . and we've never looked back. After teaching classes on a hobby basis for a couple of years, we took a huge risk - quit both of our jobs [and the steady incomes] and began pursuing our new "career" full time....Seventeen years and counting .....and we're still loving every minute of it. Our "studio" started out in our spare bedroom, but as our classes grew we recognized the need for a proper classroom and, with a friend's help, we built our new studio next to our house with a spectacular view of "our" Superstition Mountain in Apache Junction. We now schedule several classes here every month, as well as our 'away' classes at communities all around the Valley of the Sun. Check out our Calendar and Class Finder pages for details. We have been members of the Mesa Art League and of the Artists of the Superstitions, have shown and sold paintings at various local art outlets, and donate paintings every year to worthy community projects around The Valley . . . but our first and foremost interest is our classes and our students. We've met so many wonderful people - students, activity directors, and many more in the course of our travels - that the Joy! just spreads further like ripples on a pond. Bob Ross has left a marvelous legacy, and we're proud to be able to share a small part of it with so many enthusiastic people. So . . . come and share the Joy! Contact us if you'd like to learn more about getting started on your own creative journey. You'll be glad you did! Although Bob Ross is no longer with us in life, his spirit of 'happy painting' is an inspiration that will long endure. The following is a brief biography of the man who has captured the imaginations of a whole world of would-be artists. 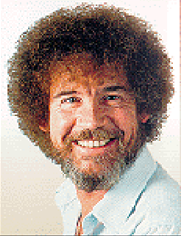 Bob Ross, Robert Norman "Bob" Ross, was born in Daytona Beach, Florida on October 29, 1942, the son of a carpenter. Beginning his 20-year career with the U.S. Air Force at the age of eighteen, Bob nurtured his love of painting. Stationed often in Alaska, the striking mountain landscapes had a lasting influence on his art. No matter how rigorous his Air Force duties became, Bob devoted time to studying privately with some of the country's top art instructors, as well as attending art classes at several colleges and universities. "Painting is imagination that you can see." He became a grandmaster oil painter, studying for a time with William Alexander, but Bob Ross also perfected the finer, more respectable arts of patience and kindness. His quiet, nurturing disposition was a form of therapy to the weary, and the reassuring intonations of his gentle voice hypnotized entire generations of his TV audience. Bob's life-long love of animals began with his Florida childhood where he made pets of armadillos and alligators. His TV series often provided him with an opportunity to introduce little rescued "rascals" including owls, robins and his own "pocket" squirrels. For eleven years, he was the host of The Joy of Painting, perhaps the most recognized, most watched art program in the history of American television. With a bushy afro and a calm, soothing voice, Bob Ross taught viewers to paint "happy little trees" and "pretty little mountains". He is credited with popularizing the Wet-on-Wet oil painting technique which is the application of wet paint on top of wet paint, omitting the traditional waiting period for each layer to dry. "There are no mistakes, only happy accidents"
Even though Bob passed away on July 4th, 1995 - at the age of 52, the result of cancer/lymphoma - his show is still being broadcast by literally hundreds of TV stations in many countries worldwide and popularity of his painting style continues to grow. Mr. Ross' wife, Jane, died in 1993. He is survived by his sons: Steve, who is a Certified Bob Ross instructor and occasionally appeared on his father's program, Bob and Morgan. "On this piece of canvas, you can do anything you can imagine .... this is your world."